Mention the name György Sebök (1922-1999) and almost certainly one will think of chamber collaborations. The two most obvious examples are those with János Starker and Arthur Grumiaux. But the Hungarian-born pianist - one of the phalanx of great musicians who studied in Budapest with Kodály and Leo Weiner – also pursued a solo career which had begun, after wartime danger and privation, in Romania where Enescu conducted for his adult debut. The Hungarian uprising saw a move to Paris and then, in 1962, and encouraged by Starker, to Indiana University. 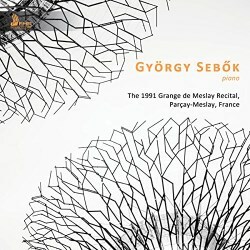 The recital captured here was given at Sviatoslav Richter’s festival at the Grange de Meslay in 1991 when Sebök was 69. The repertoire was Bach and Haydn, though the former was strongly hyphenated. Unlike the vast majority of pianists, who opt for Busoni, he plays Brahms’s arrangement, for the left hand, of Bach’s Chaconne. Seen in the context of Brahms’ intent, which was as part of a series of five studies for the piano, this makes selfless sense. It also illustrates a refusal to take more showy options in programming. Whilst the playing is not note-perfect such blurrings as exist are hardly worth worrying about in the context of a live recital. He plays with clarity, directness and nobility. The Haydn Variations in F minor, which Landowska recorded in older age, suits his preoccupation for binding material together and making architectural sense. He refuses to emote, preferring a flowing yet still affectionate approach. But his performance of the Sonata is better still. Here one finds a true conduit for Haydn’s wit in Sebök. His lightness, pert voicings, alert tempi, subtly repeated passages, and sense of timing are conveyed through splendid articulation. His passagework is marvelous, his musicianship alert: crisp, stylish, alive. I’m not sure I’ve ever heard a more vivacious and delightful reading of the first movement; it reminded me of the off-hand home recording that exists of Monique de La Bruchollerie playing the sonata; there’s a similar savoir faire and just-so nonchalance, a sharing of the captivating lightness of being. Certainly, most other recordings – see, for example, John McCabe’s – sound decidedly stately in comparison. After the interval, he continued with Bach’s Chromatic Fantasia and Fugue, in which he clearly relishes its quasi-improvisatory nature, moving on to the Bach-Liszt Prelude and Fugue in A minor, S462 in which he mediates between the demands of the music with natural voicings and sympathetic pedaling. The peroration is splendid. Busoni’s arrangement of the Toccata, Adagio and Fugue, in C major is equally fine, Sebök’s control of sonority and dynamics alike resulting in a reading of great expressive drama. In some senses, his Bach playing is reminiscent of that of another most unjustly overlooked pianist, Sebök’s near-contemporary, Mindru Katz. He plays two encores, a commanding Handel Chaconne in G major and the first Prelude from the WTC, a fittingly modest and deft end to the recital. Throughout, the restoration is excellent and Jonathan Summers’ notes helpful and pertinent. This is a most attractive and musically vivid recital and I only wish the gaps between items had been slightly longer.